"The Serpentine is a lovely lake, and there is a drowned forest at the bottom of it." 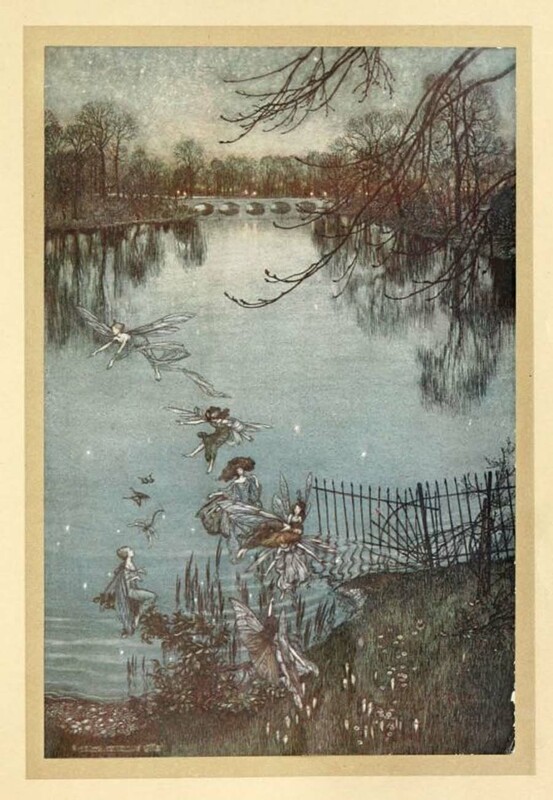 This illustration for J.M.Barrie’s Peter Pan in Kensington Gardens features Rackham’s fairies flying along the shore of The Serpentine. Peter Pan in Kensington Gardens was a prelude to Peter Pan’s Adventures in Neverland. Published in 1906, the story follows Peter as an infant who learns he can no longer fly and ends up stranded in Kensington Gardens. Instead of navigating the Gardens on foot, Peter commissions a thrush’s nest that he can use as a boat to sail down The Serpentine towards his home. Peter finds a group of fairies near the water, as can be seen in the illustration, and though scared at first, they eventually agree to help him fly home to his mother.